This was one of the cards resulting from my batch of inky backgrounds production the other day - it will be a birthday card for one of my little great nephews. Having cut my piece of Shimmery White cardstock to size, I silver heat embossed the cute little monster from the Yummy in My Tummy stamp set. I then used the plastic bag smoosh method of creating an inky background (wet cardstock, pat ink onto a plastic bag, smoosh plastic bag onto wet cardstock) using Crushed Curry and Basic Gray with a final light dab of Basic Gray. Embossing the monster first helped me to avoid adding too much colour to his body area. Once the background was dry, I used an aquapainter and green ink (Cucumber Crush and Emerald Envy) to colour the monster. I was happy for the yellow background to show through to add a bit more interest to his body. I used some Whisper White Craft ink for his eyes. When the ink was completely dry, I carefully added glue from the Fine Tip Glue pen all over the monster to make him shiny and slimey looking. 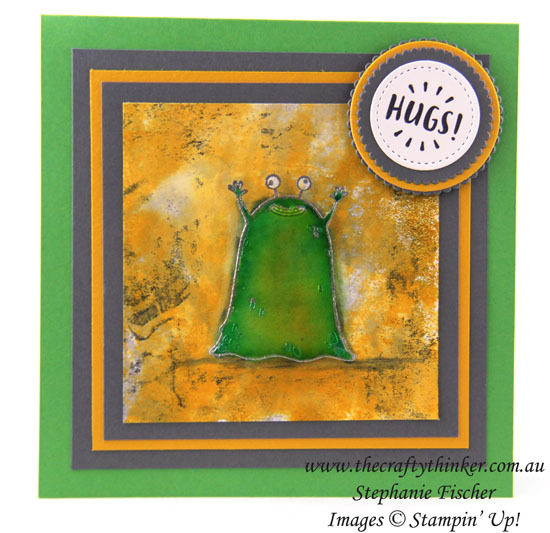 My inspiration for this came from Sara Douglass who added colour to the glue in the Fine Tip Glue applicator - I just didn't want to contaminate my glue for one card. I left it overnight to dry. Despite my best endeavours, some of the green from the monster had seeped beyond his outline, so I gave him a shadow of Basic Gray, using the aqua painter and some ink. Having layered up the card, I added the Hugs button which I made with layers of Whisper White, Basic Gray and Crushed Curry cardstock and the Layering Circles and Stitched Shapes framelits.